US President Barack Obama was advised his visit to an energy firm that later went bankrupt could come back to haunt him, newly released emails show. A Democratic fundraiser warned that investors did not rate the chances of survival for the firm, Solyndra. A White House official, meanwhile, said the May 2010 visit to its California offices could later prove embarrassing. The solar panel firm received a $528m (£340m) federal loan in March 2009, but filed for bankruptcy this August. The emails were revealed in an internal memo summarising more than 700 documents, released by Democrats on the House Energy and Commerce Committee, which is investigating the loan. Venture capitalist Steve Westly - a prominent member of the Obama campaign team in California in 2008 - warned the White House about risks associated with the solar-panel maker. In a 24 May 2010 email to White House senior adviser Valerie Jarrett, Mr Westly said: "Many of us believe the company's cost structure will make it difficult for them to survive long term. "If it's too late to change/postpone the meeting, the president should be careful about unrealistic/optimistic forecasts that could haunt him in the next 18 months if Solyndra hits the wall, files for bankruptcy, etc." Two days later, Mr Obama travelled to Solyndra's headquarters in Fremont, California. Also two days before Mr Obama's visit, an official with the White House Office of Management and Budget wrote: "I am increasingly worried that this visit could prove embarrassing to the administration in the not too distant future." Other emails, between another venture capitalist, Brad Jones, a founding partner at Redpoint Ventures, and President Obama's chief economic advisor Larry Summers, expose worries about the loan as early as December 2009. "I can't imagine it's a good way for the government to use taxpayer money," Mr Jones' email said. The White House has denied it showed favouritism to Solyndra because its investors included a private fund owned by an Obama fundraiser. The company's failure has also become a lightning rod for critics of Mr Obama's clean energy policies. But the president rejected the criticism in an interview with ABC News on Monday, saying: "There are going to be some failures, and Solyndra's an example." With the Chinese government pouring "hundreds of billions of dollars into this space", the president said: "We've got to make sure that our guys here in the United States of America at least have a shot." 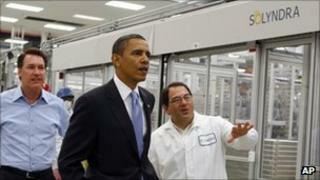 Mr Obama said that Solyndra "went through the regular review process and people felt like this was a good bet". But "hindsight is always 20-20," he admitted. The White House and the Department of Energy also reject claims they hurried the due diligence process on the loan for political reasons. Energy Secretary Steven Chu attended the company's September 2009 groundbreaking for a new manufacturing plant, and Vice-President Joe Biden spoke by satellite at the ceremony.